There has been an increase in the number of people opting for flexi-access drawdown and members have gained from the rise in equity markets with the FTSE-100 index up over the last year. UK equities are higher and the FTSE-100 index up by 23.0% since this time last year. In particular the Brexit vote of the EU Referendum sent sterling lower reducing against the Dollar from 1.50 to 1.32 by August 2016 and is now at 1.22. A fall in sterling is good for many international companies in the FTSE-100 and for those investors in flexi-access drawdown exposed to these companies will benefit with a rise in fund values. The FTSE-100 has increased by 1,376 points or 23.0% from 5,961 in January 2016 to 7,331 today. This compares to annuity rates which reduced during the year by as much as 20% and are now on average 4.5% lower than a year ago. For those that remain invested before buying an annuity the rise in equities has offset lower rates and they will benefit from more income in retirement. Flexi-access drawdown is an alternative to an annuity that allows you to keep control of your pension fund and take any level of income to meet your needs. The fund is invested in a portfolio reflecting your attitude to investment risk. The fund is unlikely to perform as well as the FTSE-100 index although it would be less volatile with a diversified portfolio. 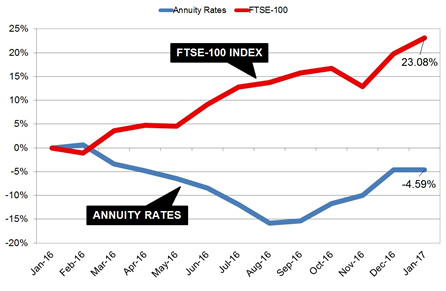 The above table shows how the FTSE-100 index has increased 23.08% over the last year to 13 January 2017 while annuity rates remain lower by 4.59%. The income taken from flexi-access drawdown is usually between 4% to 5% so a drawdown fund exposed to a higher risk portfolio over the year may have experienced double figure growth, exceeding the income taken. For our benchmark a person aged 65 years old with a fund of £100,000 buying a lifetime annuity on a single life, level basis could purchase an income of £4,696 pa in August last year. The above table shows how both gilt yields and annuities have increased since the all time low of August 2016. The 15-year gilt yields were 1.93% before the EU Referendum reducing to 0.90% in August and have since increased to 1.75% today. 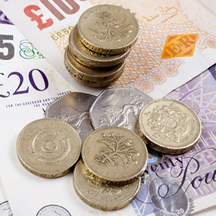 Annuity rates are 626 pa higher rising from £4,696 pa to £5,322 pa for our benchmark example. Over the lifetime of the annuitant based on the Office of National Statistics (ONS) we would expect a male to live for 17.3 years. This would mean he will have £10,829 more over his lifetime and for a female she can expected to live for 20.4 years increasing her income by £12,770.